It has been a bit of a roller coaster week around here. Sad news first. Our cat of 16 years, Mikey died Saturday morning. He has been getting quite frail and this week decided it was time. He stopped eating and drinking, by Friday his kidneys has shut down and he was unable to walk. It hit everyone hard but especially Allison. Mickey has been sleeping with her every night on her pillow for the last couple of years and she has come to consider him 'her' cat. Lots of tears and sobbing over the last few days. Even Spencer has had a lot of manly sniffles. Allison spent Saturday afternoon digging a hole in the frozen ground outside to bury Mickey so she could visit his grave. When the weather warms up a bit I think we will have to re-dig the hole or help the body disappear. But it was very touching. She had everyone throw in a handful of dirt and say good-bye. Spencer has gone out just to pat the ground and tell him what a good cat he was. Lots of interesting conversations as our kids ask if Mickey is sealed to us since he was 'born in the covenant'. As parents we have had to control the inappropriate smiles as our children have mourned. Its the first time they have actually watched the process of something they have loved die and I think it was harder for them because of that. The girls had their dance recital yesterday, thirty minutes after having Mickey die, so they were smiling with red-rimmed eyes as they danced. They were both very excited about their performance though and the flowers afterwards. Allison can really shake her hips and perform now with a big smile towards the audience. Robyn spends her dance alternating between smiling at us and looking at her teacher off-stage to make sure she is getting the steps right. We had two big parties this week which took up most of our time. On Thursday we had a surprise wake for Jeremy to celebrate his last night of youth. He had a lot of friends come by to give him a hug and eat some cake. I think he had a great time and it was fun to see so many of our friends. My favorite card of the night: Birthdays always remind me of the giant redwoods on the West Coast. They way they stand tall and proud, year after year, century after century. Their majestic beauty never fails to take my breath away. (inside the card) Thank you for planting them. I know he appreciated all their little notes, cards and gifts that were sent his way. Robyn could not understand why he was getting metamucil and adult diapers but she thought it was pretty funny. Then on Friday we had our ward party that I had the pleasure of heading up this year. I was amazed at how much everyone in the ward did to make it a success. We ended up with 420 people coming, tons of good food and then had an amazing choir program. It was a long day of setting up, getting food etc but it all came together. Jeremy had a smug-mug event this week where he taught about lighting. Spencer was quite proud that he got to go too. I am not sure how much he actually learned from the night but he was quite thrilled with the opportunity. Jeremy had one family photo shoot this week out on the frozen lake. He has been lucky enough this year to be involved in a lot of the behind the scenes Christmas help in the ward and has enjoyed figuring out how to help people. Spencer has been struggling with math a lot this week as he tries to catch up on home-work. Which means I have been struggling with math this week as I try to explain how to do all the problems he has missed. It is difficult sometimes to separate what is normal 12 year old behavior and what is bi-polarness kicking in. We talked about the Millennium today at church and it made me think about how amazing it will be when we get to meet Spencer without any mental illness or meds clouding his personality. We meet with his new psychiatrist this week, see how it goes. I don't think he needs any changes it was just time to find a local doctor. Allison had her class ski trip this week. I was glad she actually got to have someone who knew what they were doing teach her how to ski. She has no fear and just takes on the toughest runs the instructor will let her do. 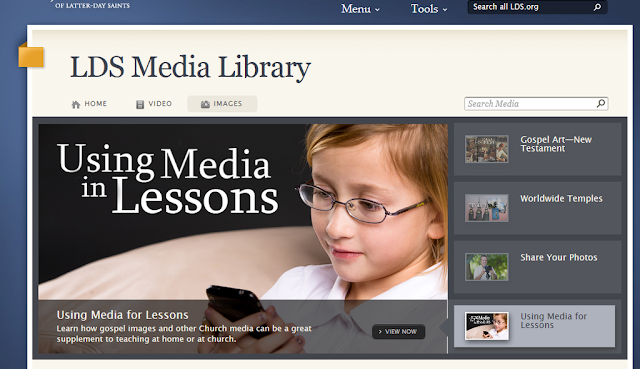 She was excited to see that her picture was being used by the church on one of their links for lds.org. I posted a copy of the screen above. Robyn has been enjoying all the Christmas festivities at school. All but Taylor have school Monday and then a half day of class parties on Tuesday. She told me this week that she is never getting married in the temple because who would want to be married to a boy forever. That would stink. She also told me that she is not having kids but is going to work in an office instead because she doesn't ever want to change a diaper. All I could think of was where did I go wrong? I tried to convince I really liked being married and having kids, but she wasn't buying it. Maybe I wasn't cheerful enough this week? We had one more Christmas party that we went to Saturday night. Kids were happy to sit and watch a movie. And I after spending a frustrating hour with Spencer's math was very happy to sit surrounded by adults, with good food and a few games. I think we all appreciated the break from each other. This time of year I am always appreciative and amazed at the people we are surrounded by and their thoughtfulness. My heart is still so sad for you guys... it can be so very sad to lose a pet that has become such an important member in your family. I remember sitting in the vet's office with my family, all huddled around our dog as the vet put her to sleep. There are only a handful of moments that have ever been as sad as that one. I will say this though, and I'm not sure if this makes Dan and I insensitive people, but he and I could not stop laughing with the "born in the covenant" comment. It always impresses me though how simple the world is through children's eyes - I envy that sometimes... it all just seems to make sense so much more easily. We love you. Hope today is brighter.